I’m an old head when it comes to television and entertainment so everyday is a Throwback Thursday for me. You won’t find me obsessing over Scandal. But you will find me curled up with my laptop watching and re-watching some of my fave classics like “The Golden Girls”, “A Different World”, and especially “The Twilight Zone“. My mother got me hooked on the show many years ago on New Years Eve when the SyFy network annually airs a 2 day marathon of the thought provoking spooky 1960’s series. Definitely one of the more creepy episodes of the show which is part of the reason why I’m so obsessed with it. What makes it so creepy is how sadly realistic it is. It tells the tale of a futuristic society (dubbed “the year 2000“) where all inhabitants undergo a surgical procedure that renders them “beautiful”. In fact, it makes all of the citizens look the same. Meanwhile there is one young lady who is adamantly refusing to undergo “the transformation”. The ending is chilling and heartbreaking and makes you think about the pressures and the priorities of the lives we lead today. This was actually one of the first episodes I’d ever seen. It follows 3 astronauts who crash-land on an unknown planet due to a fuel deficiency. Upon exploration of the planet they find that all the inhabitants are frozen in time at bizarre moments doing various bizarre activities-all except one. This episode follows a theme of the seemingly doomed future of mankind that exists in several TZ episodes. The ending is a tad sad but it makes for a great lesson in compassion and respect and even in pursuing your goals while you can. Spoiler Alert! One of the best twist endings in Twilight Zone history! Norma and her neighbor are bearing up as best as they can while trying to survive another day as the planet Earth moves closer and closer to the sun. It gets to the point where the sun is high and hot 24 hours a day and means for survival become increasing desperate and deadly. Great special effects, great acting, and a terribly twisted ending combine to make this one of the best episodes of the series. You might actually sweat while watching it. Any TZ fan will tell you this is episode is a classic. It speaks to what happens when fears and suspicions sneak into a typical All American neighborhood and takes over their ability to think clearly. While it’s meant to represent a criticism of McCarthy-ism and Cold War paranoia, I think this episode’s theme still rings true today. We should be careful of our actions and how often we allow fear and prejudice to cloud our judgement. Oftentimes, with dire consequences. Seriously, why is this episode not on anyone else’s Top Episodes list? It has a terrifying cast of characters from a murderous man trying to cover his tracks to an oddly knowledgeable child trying to help catch the killer. Best of all, it actually has a happy ending. What’s not to like? Another classic TZ episode that stays true to the series’ theme of Sci Fi fantasy and unexpected endings. I love this episode for the special effects used to depict other worldly beings and also for the sheer comedy of the story of a diner full of people all trying to decide which one of them is an alien. The ending may surprise you (twice) but the whole episode will have you on edge and trying to keep up as the clues to who is in fact the real Martian become more and more out of this world. The last episode of the last season of the original Twilight Zone. I included this on my list because my family and I always enjoyed watching it together, even though the story revolves around a family that is falling apart at the seams. But all is well that ends well. The kids in this family find that their backyard swimming pool is in fact a portal to a better life. And if their parent’s don’t solve their problems, they may lose their loving children forever. What would you do if you had the power to read minds? 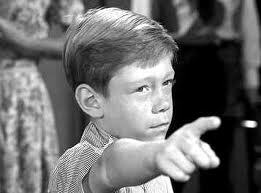 Young Hector Poole finds himself with that very ability in this favorite episode of the Twilight Zone. It’s a rare upbeat episode that will make you laugh, gasp, and wonder what you would do if you had the power to hear thoughts. And also make you rethink somethings you may be thinking about. Space travel, aliens, twist endings, and a strong moral message. All characteristics of a classic Twilight Zone episode. People are Alike All Over tells the tragic story of a scared spaceman who finds himself on a strange planet with beautiful inhabitants that are kind and helpful to him. But don’t let your guard down so easily. Not everything is as it seems. No Top 10 Episodes list would be complete with out this terrifying classic that’s been remade and parodied countless times. A 6-year-old boy tortures a small town by reading people’s minds, mutating them, and even making them disappear with just a singular thought. He forces them to think “only happy thoughts” lest they face his fury. Watching this episode will cause you to stare into the face of pure evil as he terrorizes his family and neighbors who have nowhere to run. And that’s a real good thing. A real good thing! Catch full episodes of the Twilight Zone on Netflix!